TULSA COUNTY, Oklahoma – A driver is in custody after police say he took them on a chase in a stolen patrol car Monday night, and streamed it on Facebook Live. Tulsa police say it started in downtown Tulsa in the 200 block of South Detroit Avenue around 8:00 p.m. Police say an officer left her keys in her unlocked patrol car during a quick coffee break. They say that’s when suspect John Pinney (above) walked by and swiped the car. Tulsa police sergeant Steve Stoltz said a woman called 911 and told the dispatcher a man got into a police car, asked if she wanted a ride, then drove off when she said no. Multiple agencies responded. 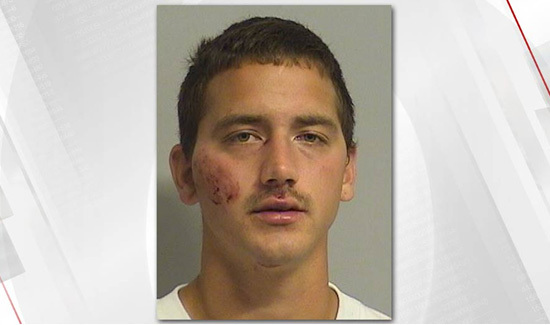 Stoltz said Pinney drove at high speeds all over Tulsa County; towards Sand Springs, Owasso, Sperry and Skiatook. Police say speeds reached more than 120 miles per hour. Officers lost the vehicle briefly but then Skiatook police found it and chased him to the 14200 block of North 88th East Avenue. Stoltz said the home belongs to the suspect’s parents. The chase lasted 30 to 40 minutes. Along the way, Pinney used the officer’s iPad to stream what he was doing on Facebook Live; in the video he sings, he brags about the chase and he turns on the siren.